Listen to Oxy Rocks on the following sites: www.myspace.com/oxyrocks, www.realmusic.ru/oxyrocks. The popular film and stage actress Oksana Mysina formed Oxy Rocks in 2003. In Moscow, they have performed in numerous clubs, including B2, the Hard Rock Cafe, Tabula Rasa, the Nest of the Woodgrouse, Blue Bird, Tochka, Chinese Pilot Dzhao Da, Poslednye den'gi (Last Money), Orakul bozhestvennoi butylki (The Oracle of the Divine Bottle), Ogurets (Cucumber), Woodstock and others. They have performed solo concerts throughout Russia at the Actors House (Moscow), the Central House of Artists (Moscow), the Vysotsky Center (Moscow), the Gatchino film festival (St. Petersburg), the Vivat Russian Cinema festival (St. Petersburg) and the Kinoshok festival (Anapa). The band has performed at various festivals and gala concerts in Moscow, St. Petersburg, Smolensk, Minsk, Byelorussia (at the Litsopad film festival) and Berdyansk, Ukraine (at the Brigantina film festival). The main part of the group's repertoire consists of songs written to lyrics by Oksana and music by either Dmitry Yershov or Sergei Shchetinin. The band's sound derives in part from the unusual combination of Sergei's American-style licks on lead guitar and Oksana's violin solos — she is trained as a classical musician. Oksana is also the lead singer, with able back-up help from Sergei, Dmitry and drummer Mikhail Zolotaryov. On the basis of Oksana's challenging, contemporary lyrics, Oxy Rocks has worked out a sound and a style unlike anyone else working in Russia today. The group had the great fortune of crossing paths with Valery Cherkesov, a renowned sound designer who has worked in Russia and Europe with numerous top artists, such as Kalinov Most, Zemfira, Kipelov and others. In the work on Oxy Rocks' first album (tentatively titled The Road), Valery also played keyboards on several tracks. 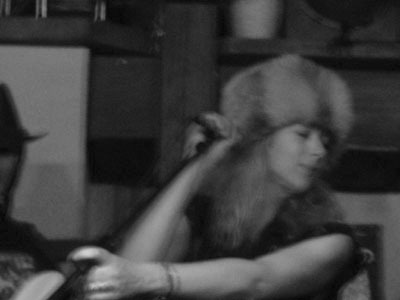 Oksana's foray into rock music has been received with great interest from the press and the public. Oxy Rocks has been profiled frequently in newspapers, magazines, television and radio, including two live hour broadcasts to the United States and Europe on the Dialogue with America show on the Russky Mir (Russian World) television station.